LVS Ascot’s alumni programme allows former pupils to stay in touch with each other and remain part of the school community after they leave. All our former students contribute to our community. LVS Ascot is very proud to help give pupils the best start to life and better prospects for future careers, and we encourage them to stay in touch with us and let us know what they are doing. Former LVS pupils include Simon Cowell, William Brake (founder of Brake Bros), Tracey Ullman and Holly Tucker (founder of Not On The High Street). By registering for our alumni network, former pupils can advertise their skills and professional services to other alumni members, providing excellent networking opportunities. 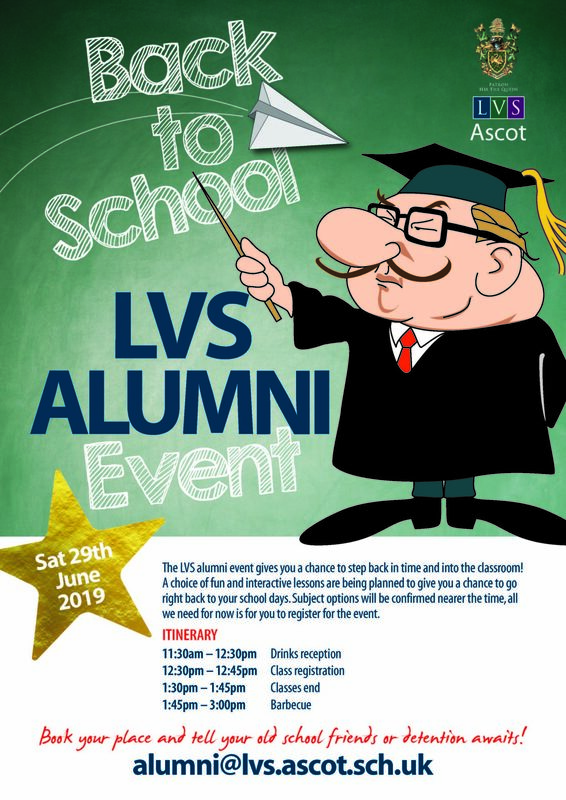 LVS Ascot also hosts an annual alumni event or school reunion allowing past pupils to come back and see the school, meet old school friends and teachers and enjoy relaxed social occasions at the school with the opportunity to network. This year, the summer LVS alumni event will take place on Saturday 29th June 2019 from 11:30am – 3:00pm. In addition to a free drinks reception and barbecue, we are also giving former students the opportunity to step back into the classroom and take part in a lesson of their choice! Subject options will be revealed nearer the time for what promises to be a lot of fun and a real blast from the past for you. All you need to do in the meantime is reply to alumni@lvs.ascot.sch.uk to reserve your place at the event. Please do share this with as many old LVS school friends as you are still in touch with to help us spread the word. A further benefit of being an alumni member at LVS Ascot is the opportunity to attend a whole host of school productions and performances. From plays to music and sporting events, the school would like to welcome back past pupils to enjoy, and share in, the talents of current pupils. We invite alumni back to attend everything from Music Festivals to drama productions to give a valuable social aspect to membership.